Title [Women working in a room at the Chicago Public Library, where they are collecting books for U.S. soldiers] [graphic]. 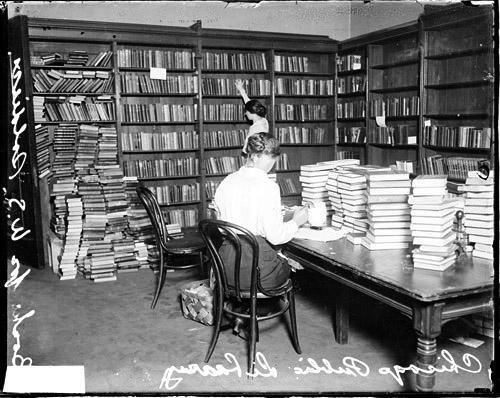 Collection summary Image of two women working in a room at the Chicago Public Library, where they are collecting books for U.S. soldiers. One woman is sitting at a table stacked high with books and the other woman is standing in front of a full bookcase. This image was taken in Chicago, Illinois. Names Chicago Public Library Employees.